Rollover bonuses in matched betting are fantastic ways to make money from matched betting in the beginning from the initial sign up offers. Rollover bonuses are slightly different to other types of freebets because they have something attached to them called a wagering requirement. We will come on to a wagering requirement shortly but freebets usually just require a qualifying bet and then you get credited your freebets from the bookie. Then you just back at higher odds to guarantee a profit and then you’re done with the offer and you can move on to the next one. Rollover bonuses work in a different potentially more sophisticated way, so it is important you know how to deal with rollover bonuses so that you can maximise your profits when dealing with these types of initial signup offers. A wagering requirement is the total number of bets you need to place before you will be able to withdraw your funds from a bookmaker. This is usually express as multiplier of your initial deposit and the bonus combined. For example, an offer could say “Bets must be wagered 6 times your initial deposit and bonus combined before withdrawal”. Let’s say our initial deposit was £100 and we got a bonus also of £100, this combined would total £200.00. What this means is that we must then place 6 times £200.00 worth of bets before will be able to withdraw from our account at the bookmakers. So we must therefore bet £1,200 before we can withdraw. Now this may sound scary as normal freebets offers usually require no more than a £100 deposit and then you place your bet and then you are done once you have bet your freebet. Thankfully there is a great way you can reduce your worries and maximise your profits whilst also keeping control of your liabilities. With rollover bonuses, if your first bet wins, you will have to keep placing bets with that bookmaker until you are able to finally withdraw your funds. This can potentially require larger liabilities at the betting exchange and if your bookmaker back bets keep winning, these liabilities will be quickly moved over to the bookmaker which can be a daunting experience. If your first bet loses at the bookmakers, you will be able to walk away from the offer and your profit will be in the betting exchange and you can move on to the next offer. Job done! Of these two options, which sounds the better option to you? Of course it is the second option whereby your back bet at the bookmaker loses and wins at the betting exchange. We will now come on to the best strategy to tackle the rollover bonus offers so that they cause you as little stress as possible. This is the moment you have been waiting for; how to deal with rollover bonuses. First of all our ultimate goal is to try and lose our first bet with the bookmaker along with the bonus and win our lay bet at the exchange. This means we will have no more hassle of placing further back bets at the bookmakers and we can relax and count our profits. You may be thinking “surely it is best to choose a bet at high odds as that will have less chance of winning”. Whilst that may look to be the best way to handle these offers, that couldn’t be any more wrong. Imagine you have just backed £200 on a selection at odds of 10.0 and the worst thing possible has happened; it has WON! You will now have £2,000.00 sat in your bookmaker account with more bets to place before you can withdraw. If you have a low bankroll this is not a good position to be in as your bonus could expire if not fully rolled over within 7 days and now the panic starts to really settle in. First of all DO NOT place bets on selections with high odds. This can be disastrous if you have a low bankroll and the last thing you want is loads of money going from your betting exchange into the bookmaker accounts. I recommend sticking to as close to the minimum odds as possible so that liabilities are kept low. Lower liabilities mean lower stress and you’ll thank yourself for not being glued to the event. Yes lower odds may increase the chances of the selection winning but in sports betting anything can happen and it would be much better for £60 to go out of the exchange than £600. UNDERLAY ALL YOUR BETS. This is important. 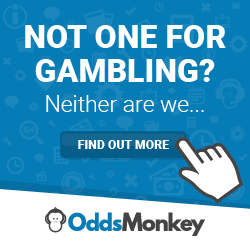 By underlaying your bets on the matched betting calculator at Oddsmonkey, you will take a bigger qualifying loss if your bet loses and wins at the betting exchange, but you will have no more bets to place at the bookmakers. Plus even if your bet wins at the bookmakers, you will lose nothing from your bonus which will in turn maximise your profits. ONLY USE A STANDARD CALCULATION ON YOUR LAST BET. If you have underlayed all your previous bets and now you have just one bet left to place, there is no point in underlaying your last bet. You may find by underlaying you will have a bigger qualifying loss than by using a standard match on the matched betting calculator at Oddsmonkey. By underlaying your qualifying loss on the final bet could be £16.00 but by doing a standard match you could only end up losing £5.00. By time you add back your £50 bonus you will be £45.00 up in guaranteed profit opposed to £34.00 profit. It makes more sense to guarantee a £45 profit than to risk it and make a £34 profit when you have no control over what could happen in the event. Follow this strategy and you will have no worries or stresses about the event you have betted on and you will have low liabilities which is what you should always aim for when doing rollover bonuses. By underlaying your bets from the start, you will also make your life much easier if the first bet loses and wins at the betting exchange. It makes much more sense to lose £10 of your bonus to get the offer done quicker than to have to place anymore bets to make a few extra quid and underlaying will keep you in this position until your last bet when you can just do a standard bet and maximise your profits. Rollover bonuses aren’t scary at all and are actually a fun way to make some extra profits from your matched betting activities especially as you go through the initial signup offers. Use the strategy as mentioned in this article and you will reduce your worries and stresses over something you can’t control; the outcome of the event. Dealing with bigger liabilities is unnecessary and will only cause you more panic and distress so avoid this and stick to the minimum odds where you can. As a rule of thumb stick to odds around 2.0 (evens) and you will be fine. This way, your liabilities won’t suddenly go through the roof. Underlaying bets is great until you get to your last bet and this will also maximise your profits from the rollover bonus offer you are doing so make sure you stick to this. Follow and apply the 3 step rollover strategy with rollover bonuses and you will have the most enjoyable experience from them and this will encourage you to try further offers like this in the future rather than being put off by them. Make sure you join Oddsmonkey too to take advantage of the rollover bonuses on their along with the tuition on tackling the offer as well as their amazing matched betting calculator so you can both underlay your bets and use the standard match. You can join Oddsmonkey by clicking here. I also recommend using Smarkets betting exchange who offer 2% commission which will also help reduce your qualifying losses and keep your profits high. This is essential when dealing with rollover bonuses. You can get £10 for joining Smarkets by clicking here. Paddy Power 2 up offer & how you can profit from this excellent offer!